Every person we know and love is special in their own way and we often want to show this on their memorials as a lasting tribute to the wonderful people we knew. At McDougall Memorials we can make your memorial as unique and personal as you wish with our creative artwork and finishing options. With new memorials we offer a viewing before cutting option. This allows you to see the layout of the stone and gives you the chance to change something you may not have been sure of before the cutting in process starts. You then have the peace of mind that the memorial will be exactly how you want it to be. 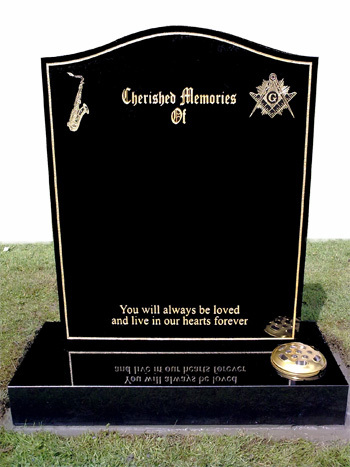 We have a large library of designs in our showyard that can be applied to our range of grave stones that can reflect the hobbies and interests of your loved one. From fishing to vehicles to custom artwork, we have options to suit everyone. Any images we dont have in our large libary can be created at additonal cost but most designs we do have and additional costs don't apply very often. These are just some of the wide variety of designs we have available, we can create any image that you wish to use on your memorial if you request something we don't have. Contact us with your requirements and we'll help you out.